A special opportunity to receive individualized, personal instruction into the practice of deep Tantric Meditation. Neelakantha Meditation is the practice of deep meditation that works to bring about transformation, healing, and benevolence in your life. The two-day course is just the beginning of a lifetime of practice and includes several forms of support for your practice. 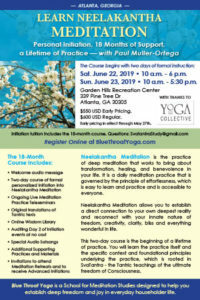 You will learn the practice of Neelakantha Meditation and the specific context and foundational principles underlying the practice, which is rooted in SvaTantra – the Tantric teachings of the ultimate freedom of Consciousness. By the end of the course, you are fully equipped with the technique and understanding to practice on your own each day with extraordinary benefit, along with ongoing support. 18 months of practice support and study, including Live Meditation Practice Teleseminars, original translations of Tantric texts, online wisdom library, Day Two of subsequent Initiations at no cost, Special Audio Satsangs, Additional Supporting Practices, Email Support, and Invitations to attend Meditation Retreats and to receive Advanced Initiations – everything described here. *Special Early Pricing through May 27.